Health 1500 hosted a Suicide Prevention and Awareness presentation on Nov. 28. 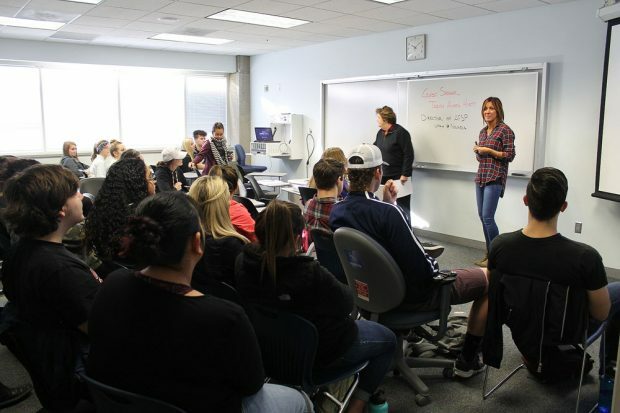 The room was filled with students interested in hearing what guest speaker Taryn Aiken Hiatt, Director of the American Foundation for Suicide Prevention in Utah and Nevada, had to say about such a tough subject. “Unfortunately, [suicide] is now the leading death for youth in the state of Utah,” Hiatt says. Hiatt started out by sharing her personal experiences and how she got involved with AFSP 15 years ago. She looked at the clock and noticed that it was 10:10 a.m., which happens to be the actual time when she found her father after he took his own life Oct. 5, 2002. After researching online, she found that AFSP did not have a chapter in Utah. Hiatt quickly changed that by hosting her first “Suicide Prevention Walk” to raise awareness, as well as money, for the cause. The classroom listened quietly to Hiatt’s very emotional and raw presentation, or “conversation,” as she calls it. There has been fear in the communities for years that, if suicide is discussed, it will give people the idea to do it themselves. This is a myth that people like Hiatt hope to dispel. Unfortunately, since many aren’t talking openly about it, the death rate continues to rise. Those who have been affected may not know who they can share their experience with, or, how it could even happen to one of their loved ones. They are encouraged to have open and honest conversations about it. Over 800,000 people die by suicide every year, according to the World Health Organization. Suicide is a mental health issue with multiple risk factors that comes with it. Health conditions, environment, and family history could all play a role in suicide. College students can be prone to suicidal thoughts. Deadlines and other pressures in life can be very stressful as the end of the semester approaches. Having this type of conversation can potentially help many students. Visit AFSP Utah for local chapter events and program information. The above comment is beautifully expressive. I could not agree more with what you are saying and I think that your point about how quickly we move on and to an extent justify suicide, as well as the attention you draw to how desensitized we have become to our peers’ problems. Great article Karina! It was interesting to read and especially lately since I have had a small handful of friends dealing with suicide in their own family, it struck me more to the core than it might usually. Thanks for sharing! In a society that is apathetic towards your very existence, and expects you to fully support yourself for the sake of society, it’s no wonder that people get so disattached from fulfillment of their day to day lives. Modern social media doesn’t build the communities that humanity needs for an interpersonal purpose – it builds fleeting connections based on identity politics and vacuous labeling. It’s not just that people need “someone to talk to” as the article suggests, but that the very foundations that we’re building the future on, lack any meaningful communities, connections, and communication where we feel like someone actually cares about our lives, and we care about theirs. As a specific example: if someone goes to their classes at SLCC for a month or two and suddenly stops showing up, neither the professors nor the fellow students will give a crap about the missing student. A sudden life stress or emotional trigger has caused the vast majority of people to experience chronic depression and have suicidal tendencies. And their names are forgotten. No news outlet, no college, no society does anything but brush their very memory and past existence under the rug. Yet I think we all have known someone that has taken their lives, and shed tears of remembrance annually. But this doesn’t even discuss the rise of existential and nihilistic understanding in Salt Lake and other secular cities across the globe. If the previous circumstances can lead to an impulsive, emotional suicide, I’d also there’s also a huge rise of compulsive, rational suicides. When you realize that your life has no divine or intrinsic purpose, then you can assess the finer details of your life, opportunities, circumstances, and personal traits that you will likely have to endure for the rest of your life. Some, like Albert Camus, will be attractive and wealthy enough to have a slew of women thrown at them for their hedonistic pleasures. Others will realize that they’ll be stuck as a meaningless cog of the collective and quite simply, don’t view that as a valuable life. But organizations like this do nothing but help people feel less guilty for the fact that suicide rates will continue to rise. It’s an excuse to not actually be there for the people you love, or the people in need. If you’ve built genuine trust with your friends, to the point where they tell you about their suicidal thoughts – you either give them the necessary support, or you learn and understand why they have made their mortal choice. Guilt, shame, and regret only make the problem worse.